Today we have the pleasure of introducing author Lise Arin! She's written a historical fiction novel about a real historical figure, Empress Matilda. For this post she's written up a list of 5 things about the real woman. How do you feel about fiction books based on real characters? Are there any historical figures that you are drawn to? The real, historical Matilda is most remembered by two lines of the epitaph inscribed on her tomb: Great by birth, greater by marriage, greatest in her offspring, Here lies the daughter, wife and mother of Henry. For Matilda Empress, I transformed this verse into a witch’s prophecy. Matilda was married twice, first betrothed at age 8 to the Holy Roman Emperor Henry V, and secondly at age 26 to Geoffrey of Anjou, a Plantagenet. She was Eleanor of Aquitaine’s mother-in-law! She bore only sons: Henry II, Geoffrey and William. I have given my heroine another (illegitimate) boy, Gervase, and chosen to believe the stories of another (still-born) son born to her first husband, the Emperor. 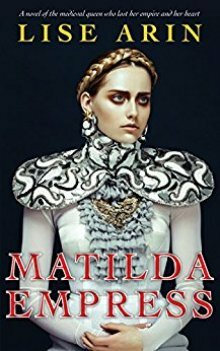 A novel of the medieval queen who lost her empire and her heart.